The 2020 Republican National Convention will be an event in which delegates of the United States Republican Party will choose the party's nominees for President of the United States and Vice President of the United States in the 2020 U.S. presidential election. The convention will be held from August 24 to 27, 2020,[dead link] at the Spectrum Center in Charlotte, North Carolina. By tradition, because Republicans currently hold the White House, their convention will be held after the 2020 Democratic National Convention, which is scheduled for July 13–16. 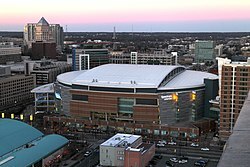 The Spectrum Center in Charlotte, North Carolina will be the site of the 2020 Republican National Convention. Las Vegas, Nevada and Charlotte, North Carolina were mentioned as possible destinations for the 2020 RNC due to their locations in "swing states." Neither had ever hosted a Republican National Convention, although Charlotte had hosted a Democratic National Convention (in 2012). A Charlotte television station, WBTV, reported that Charlotte, Las Vegas and "another unnamed city in Texas, which sources at the meeting said were likely either Dallas or San Antonio," were finalists to host the convention. Other sources named Dallas, Texas and New York City, New York as propectives, while Las Vegas, Nevada, Nashville, Tennessee, Philadelphia, Pennsylvania and San Antonio, Texas had been under consideration earlier. On July 18, 2018, the RNC Site Selection Committee voted unanimously to recommend holding the convention in Charlotte. The Republican National Committee made the selection official on July 20. Prior to the business of nominating a presidential ticket, the delegates would approve a manifesto called a "platform." Sections within this "platform" are known as "planks." In the past the wording of these planks have been extremely contentious, although platforms are very seldom read by the voting public. Since that time, former Massachusetts governor Bill Weld has declared himself as a challenger to President Trump. The Republican Party, depending on the state or territory, chooses its delegates via either primary or caucus. According to rules agreed to in July 2016, "a candidate has to win a majority of the vote in eight states to have his or her name placed into nomination at the convention." There will then be a ceremonial roll-call of the states. The Vice presidential candidate is designated by the nominee and is nominated by acclamation. There hasn't been a roll call for Vice president since 1984. ^ Ochsner, Nick. "Source: Charlotte named finalist to host GOP convention in 2020". Retrieved November 6, 2018. ^ a b Dyches, Chris; Ochsner, Nick (May 4, 2018). "Source: Charlotte named finalist to host GOP convention in 2020". WBTV. Retrieved May 4, 2018. ^ Whalen, Bill (May 30, 2018). "Why L.A. Could Host Dems in 2020 (and Why It Shouldn't)". RealClearPolitics. Retrieved June 17, 2018. ^ Morrison, Jane Ann (December 7, 2013). "City may not be ready for GOP convention in 2016, but in 2020 ..." Las Vegas Review-Journal. Retrieved October 30, 2015. ^ a b c Wilson, Reid (May 11, 2018). "GOP has few takers for 2020 convention". The Hill. Retrieved July 7, 2018. ^ Collins, Michael (May 11, 2018). "Nashville drops campaign to host 2020 Republican National Convention". The Tennessean. Retrieved June 17, 2018. ^ Bruno, Joe (July 19, 2018). "RNC IN CHARLOTTE: Republican leaders unanimously select Charlotte as site for RNC in 2020 pending final vote". Retrieved November 6, 2018. ^ Josh Putnam, How the Republican Party made it harder for convention delegates to vote against Trump, The Washington Post (July 17, 2016).